The leaves are dark green and shiny with serrated edges, fruit are yellow green similar to a mulberry. Aboriginal Fire sticks were probably the sourced from these trees by the Indigenous people of this area as this is one of a few known sources of Austral mulberry on the Mornington peninsula. The straight stems are a hard wood that with friction will ignite dry tinder. This tree has a very hard wood which provided material for Indigenous people to generate fire. 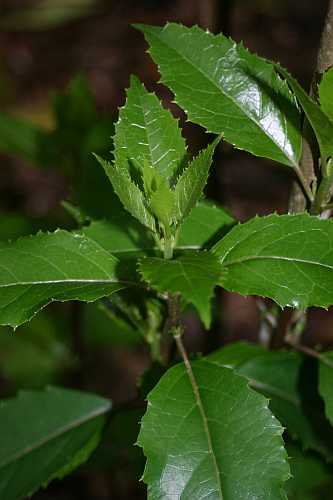 The straight upright shoots of the Austral Mulberry (Hedycarya angustifolia) were used as fire-drills. A dry piece of stem about 60 cm long and 1 cm in diameter was twirled rapidly in a hole made in a flat piece of wood. The dry flower-stalk of the Southern Grass tree was often used as the base, and once the drill began to smoulder it was then tipped onto some dry stringybark and blown gently to generate a flame. The Bun Wurrung word for the fire drills is Djiel Warrk.